For the first time in U.S. history, the Surgeon General has sent letters to each and every physician warning them about the Opioid Epidemic. Dr. Vivek Murthy is not only asking for changes in prescription practices, but also "asking clinicians to help us change how our country thinks about addiction." For a more in-depth analysis of the role physicians play in this health crisis, please read my blog post, "Heroin Epidemic Reason #1: Blame the Doctors". As evidenced by the Surgeon General's warning, we must all take steps to change how the country thinks about the disease of addiction. To that end, I am donating all my author proceeds from my novel, Addiction on Trial, to addiction treatment centers, homeless shelters and academic endeavors that support the destigmatizing of addiction. I hope you will consider buying a copy for yourself or to give it as a gift to anyone interested in changing hearts and minds about the disease of addiction. Please also visit my Facebook page or Twitter account to learn which organizations have been identified as the beneficiaries of this ongoing fundraising campaign. If you would like to recommend any additional organizations that would benefit from an author-proceeds fundraising campaign, or awareness-building social media posts, please send information to me through my Contact Page. Below, please read about how Dr. Vivek has taken unprecedented steps by sending an official Surgeon General's warning to all doctors about opioids, which he calls 'the health crisis of our generation'. I have included below a copy of the personal letter I received. 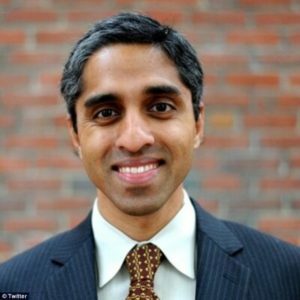 I look forward to assisting the Surgeon General in his mission to destigmatize the disease of addiction! Remember - "It Takes a Village" and "A Thousand Points of Light". I welcome your comments, questions and insights by either clicking "Leave a Reply" below, or by answering any of my Polls about the Heroin Epidemic! Posted in Author Blog. Tags: Addiction Advocacy, Addiction Awareness, Addiction On Trial, Addiction Treatment, Dr. Steven Kassels, Heroin Epidemic, opiate addiction, the disease of addiction on August 31, 2016 by skassels. Over the next few weeks, I'll be asking questions of my blog, book and social media readers. This poll relates to the stigma around opiate addiction, and how culture plays into it. Today's question relates to why you may watch or read fictional content about opiate addiction? For Question #1, click here, and for Question #2, click here. Thank you for answering, and please share with your friends! Posted in Author Blog. Tags: Addiction Awareness, Dr. Steven Kassels, Families of Addicts, opiate addiction on June 15, 2016 by skassels. Implantable Buprenorphine – A Cure-all for Opioid Addiction? I commend Martha Bebinger and NPR for bringing forward the latest information re: implantable buprenorphine to treat patients who are opioid dependent/addicted. The implant system has four controlled release buprenorphine rods that are placed under the skin and the effect can last up to six months. The FDA is expected to make a decision about this treatment approach within a few days. However, just as there is no one antibiotic to treat all bacterial pneumonias, or one way to treat every person who has diabetes or depression, there also needs to be multiple approaches to treat addictive illnesses. What commonly gets overlooked is the underlying hallmark triad of addiction with its biological, psychological and sociological components. Medication may be an essential aspect of treatment for some, but addressing the behavioral/psycho-social aspects through counseling cannot be ignored or minimized. In fact, it is through the behavioral treatment approach that patients better understand the nature of the issues and cues that contribute to drug seeking patterns. When treating a patient with oral buprenorphine (Suboxone), the patient receives a maximum of a thirty day prescription. In between the monthly medical visits and sometimes concurrently with the doctor visits, the patient may engage in group and/or individual counseling sessions. So just as we as a society want quick fixes for many things, we need also to be careful how we look at new treatments. The issue of wanting our pain totally relieved has contributed to the over prescribing of pain medication. Immediate gratification is always enticing, but not necessarily the best approach. Surely, implantable buprenorphine has great promise, especially if it is reasonably priced. While some patients may need the daily structure provided at a methadone treatment center or be better served by methadone if their tolerance is exceptionally high; other patients may be better served by a prescription for oral buprenorphine and monthly or weekly medical visits; and yet others may be better served by implantable buprenorphine; but all patients will be best served by incorporating a structured behavioral component into the treatment plan. Implantable buprenorphine is not a cure-all for opioid addiction but it will be a welcome addition for physicians to have at their disposal. Posted in Author Blog. Tags: Addiction, Addiction Treatment, Buprenorphine, Dr. Steven Kassels, Heroin Addiction, opiate addiction on May 24, 2016 by skassels. Eggs & Issues: Is Heroin Addiction a Disease? KasselsEggsIssuesClips from Steven Kassels on Vimeo. I recently had the opportunity to talk at the Portland Maine Chamber of Commerce monthly meeting. I hope you will listen to my presentation, and let me know if you agree or disagree. But regardless, if we do not aggressively address this scourge to society, we will continue to spend inordinate funds on treating the consequences of addiction. As they say, "You can pay now, or you can pay more later, but you are gonna pay." Posted in Author Blog. Tags: Addiction, Addiction Advocacy, Eggs & Issues, Heroin Addiction, opiate addiction on February 21, 2016 by skassels.